On Saturday, my sister and I went to the second of Jay-Z’s eight nights at the Barclays Center. My sister, in a tremendous act of younger sibling goodwill, had bought the tickets for us a few weeks earlier. The day of the concert, I was drinking coffee, walking aimlessly around Cobble Hill and thinking about happiness. About how its not possible to truly have everything. I thought about the good things in my life: I have a job; I have published some of my fiction; I live in a studio apartment in a nice neighborhood in Brooklyn; I have friends who I would die for and who would do the same for me; I have supportive parents; and I have a sister who I’m close with and who would buy me tickets to an historic Jay-Z concert. What’s missing from that list? Love and the ability to live off my writing. But, really, those two things are pretty hard to nail down. Then, as I stopped at Cobble Hill Park to read, I tried to decide if there was anyone in the world who was truly happy in every aspect of life. After going down the list of people close to me, naturally, my mind wandered to Jay-Z—he’s rich, he does what he loves, he’s an icon, he has a beautiful wife who is also an icon, he has a child, and now he has a stadium that he helped to bring to his hometown. If there was anyone who should or would be the definition of “happy,” it would have to be Jay-Z; and Jay-Z spent much of his youth as a drug dealer, which reminded me, yet again, of America and of The Great Gatsby. Except, Jay-Z gave up the life of crime that Gatsby had slowly taken upon himself. So maybe they weren’t exactly the same, but, still, something about it all fit. When my sister arrived, we went to an French restaurant on Atlantic Avenue. The hostess sat us down and I was curious if she could tell that we were brother and sister. It was a good restaurant and we had dinner and some wine. We talked about Jay-Z’s discography and marveled at the longevity of his career. My sister made predictions about possible guest appearances and wondered if Jay would try to pull off some of the Watch the Throne tracks without Kanye—my sister really likes “Why I Love You.” After I double-checked the track-list for Blueprint Vol. 1, we started talking about her life. She asked me for some advice about dealing with guys and, without getting defensive or protective or insecure (which is something I take a great deal of pride in), I gave her my honest opinion of how to conduct herself. And she seemed to listen, which is what I truly appreciate about my sister. I paid the bill for us—lil’ sis had bought the tickets—and we walked down Pacific Street towards Fifth Avenue, where my little residential street would open out onto the brand new Barclay’s center. First we stopped for a beer at Fourth Avenue Pub and I explained to my sister what Belgian Trappist beers were and elaborated on why I have grown out of drinking dark ales and now enjoy pilsners and Kolsches (“They are very cold and they taste like something else.”) above anything else. Then, I told her why the Barclays center was going to do nothing but help the bars and businesses all along Fourth Avenue; and she listened and nodded her head. At about five to eight, we left the bar and approached the Barclays Center. There were blue and green laser lights shooting up into the overcast sky that hung above the Atlantic Center and my sister and I crossed Flatbush Avenue. Then, we were standing with the crowds underneath the impressive front awning of the Barclays center. A car ad was playing on the interior of the awning, but I forget what the brand was (I was a little buzzed). “That’s great advertising space,” my sister said. There were lines to get in the doors and I pointed out a short one that was moving well. Soon we were in the arena’s vestibule and ready to walk through the metal detectors. My sister and I were looking for the shortest line, when an usher smiling broadly brushed my shoulder. If you think I’m making this up, you’re entitled to your opinion, but that’s the kind of night it was. 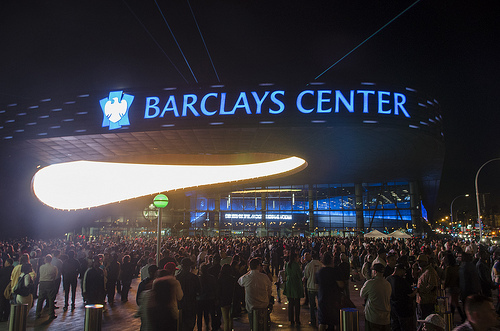 This was the second night the Barclays Center had known and Jay-Z was playing once again. As my sister said, “We’re one of the first 36,000 people to be here.” She was right—the crowd knew it and the staff knew it too. We went right to our seats in section 209 and took in the arena. We wondered about the red-carpeted VIP section that stood directly across the crowd from the stage; and we looked at the luxury boxes and floor seats and tried to guess how much each seat cost. “These seats are pretty good,” my sister said. It was barely 8:30, so we went down, bought beer and sat in a nook by one of the windows facing the Atlantic Terminal. We were watching the crowd and all of a sudden I was waxing poetic to my sister about the Beatles, which made me realize that I was getting drunk. “Everything that could possibly go right, went right,” I said. And my sister, though she’d probably heard this from me before, listened intently. We finished our beers and each went to the bathroom. When I came out, my sister was standing near a wall and blushing. “I just got hollered at,” she said. I went up and asked for four beers. The woman at the register told me that she wasn’t supposed to give out more than two. However, she looked around and had the girl working the tap slide an extra two beers over. Like I said, it was that kind of night. We made our way to our seats just as Funkmaster Flex was warming up the crowd. He implored the crowd to get up and make noise for their respective nationalities: Haitians, West Indians, Caucasians, Africans, Dominicans, and of course Single Ladies. Each different background was well-represented and everyone made noise. I thought about Joseph O’Neill’s novel Netherland, which I just read and which celebrates New York and especially the diversity of Brooklyn so well. And its that diversity that has made me fall in love with Brooklyn over the years. Like my beloved Kolsches and pilsners, I love the borough because wherever you go in Brooklyn, it tastes like something else. Then the lights went out and a montage of Brooklyn through the years played on a large sloping screen above the stage. Even though I’ve only lived in Brooklyn for four years, it made me proud. My family is from Long Island, mainly by way of Queens, but we’ve had some blood and sweat poured on the docks at Red Hook and I suppose that’s valid enough. Finally Jay-Z emerged, stating we were all from Brooklyn. The crowd roared in approval. Again, even if we were part of the second 18,000, there was something special in the air. That’s what it felt like. It seemed like Jay-Z’s personal history as well as the history of the borough that he knew so well were both simultaneously flashing before his eyes; they were visions only he could see. That’s where Gatsby comes in. As Hsu says in his piece, the Jay-Z on stage at Barclays was “a symbol returning to earth as a man” because he wants to know what it is to be “flesh and bone” again, back in the dirt again. Jay-Z is Gatsby if Gatsby had actually been able to hold Daisy in his hand and take her away from Tom. Jay-Z has the woman—he has his borough, he’s reached out to the green light and touched it, yet it will probably never be as green as whatever light illuminated the images that were playing in front of his eyes on Saturday night. And that’s not sad, but it just shows you that even the “happiest” man alive can’t have everything. Nothing is commensurate to man’s ability to dream, especially in America. I’m happy about the Barclays Center mainly because I think its great for the kids of the current generation of Brooklyn. I like seeing the kids on my block wearing black and white Nets jerseys—it makes this time seem more real. Like Marc Jacobsen said, in New York, this Brooklyn is the Brooklyn those kids will come of age in; and in their Brooklyn the Nets and the Barclays Center are a reality. That’s a detail that will follow them throughout their lives and it will be there when they, older, let their minds wander and their eyes drift like Jay-Z did in front of that crowd of 18,000. The concert ended and my sister and I filed out with everyone. Before we knew it, we were back in the quiet solace of the brownstones on Pacific Street. I laughed and shrugged and we walked back to my apartment where my sister got the keys to her car. There was a party in Williamsburg I wanted to go to, so I asked her to give me a ride. We drove down Smith Street and through Downtown Brooklyn, got on the B.Q.E., listening to “Public Service Announcement” as I drunkenly expounded on The Black Album and what it meant when it came out during my freshman year at college. Finally, we got off at exit 32 and I asked my sister to just drop me off on the side of the road along the B.Q.E. underpass near some garbage. “I know where I am,” I smiled. I hugged her, kissed her and showed her the way to get on the B.Q.E going East again. “Thanks a lot, Kel,” I said and closed the door. She rejoined the flow of traffic and set off back to "our" Long Island while I set off into Williamsburg on a Saturday night. As I walked, passing couples and people younger than me bouncing from restaurant to bar and bar to restaurant, I felt like a stranger in a strange land. I lived in Williamsburg for four years and now, just moving a few miles south, it seems as though I live in a different world. It’s not a better world, its just different. I don’t feel “too old” for Williamsburg and I still like hanging out there from time-to-time; because its all Brooklyn and I’m bound to run into somebody I know somewhere. Forgot to mention that one of the "visions" Jay-Z saw was probably Brooklyn native...HARRY NILSSON! An excellent post. Hah maybe you should remain in Brooklyn after all.